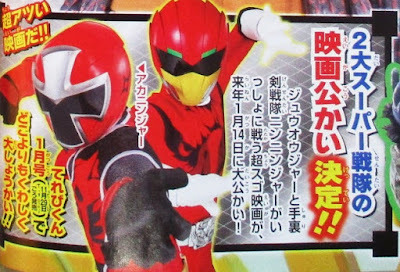 Thanks to this month's issue of Terebi magazine, the upcoming Super Sentai crossover movie for this year is finally confirmed! 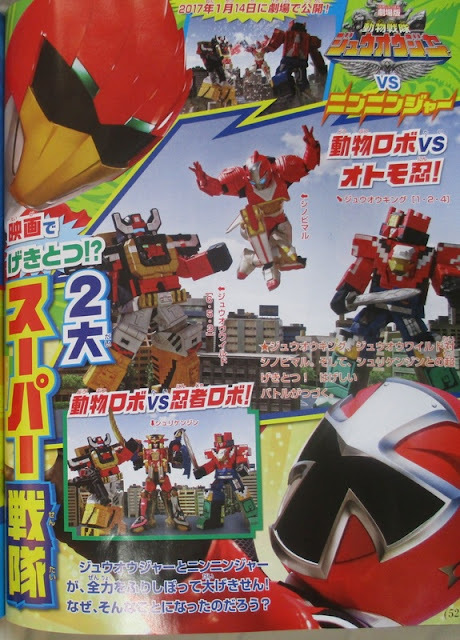 It's Dobutsu Sentai Zyuohger VS Ninninger, folks! No other information about the story or if there will be other Super Sentai heroes that will join in (and the new Sentai team is expected to debut in this movie) has been handed out yet but looks like the movie will start with a mecha battle between Shinobimaru which will later transform into Shurikenjin and the duo of Zyuoh King and Zyuoh Wild. I'm guessing it's because the Super Doubutsu Taisen special which comes with every Zyuohger Blu-ray already serves as Zyuohger VS Super Sentai.